An aquarium catfish need not be expensive to make a new and very interesting addition to the aquarium. One prime example is this month's Catfish of the Month introduced to us by Paul E. Turley. Hisonotus leucofrenatus is a small (25mm) Otocinclus-like species of Loricariid catfish seasonally imported from Paraguay under the common name: Otocinclus sp. "Niger". Unfortunately I have no firm insights as to the origins of this trade name, perhaps it just means black or dark? 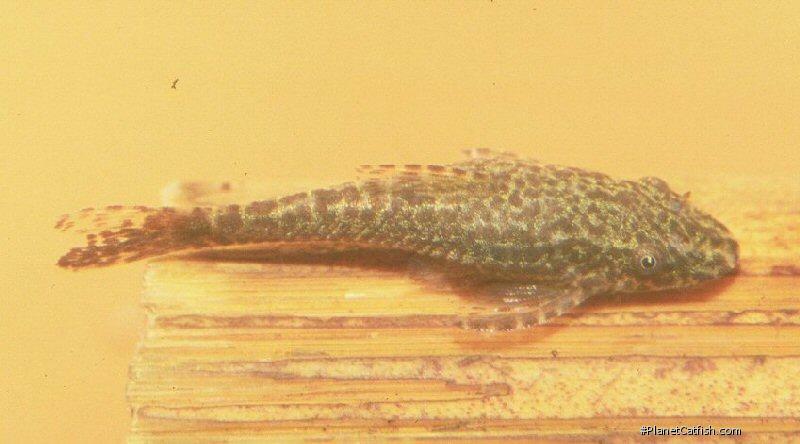 It was originally described by Miranda-Ribeiro as Otocinclus leucofrenatus in 1908. 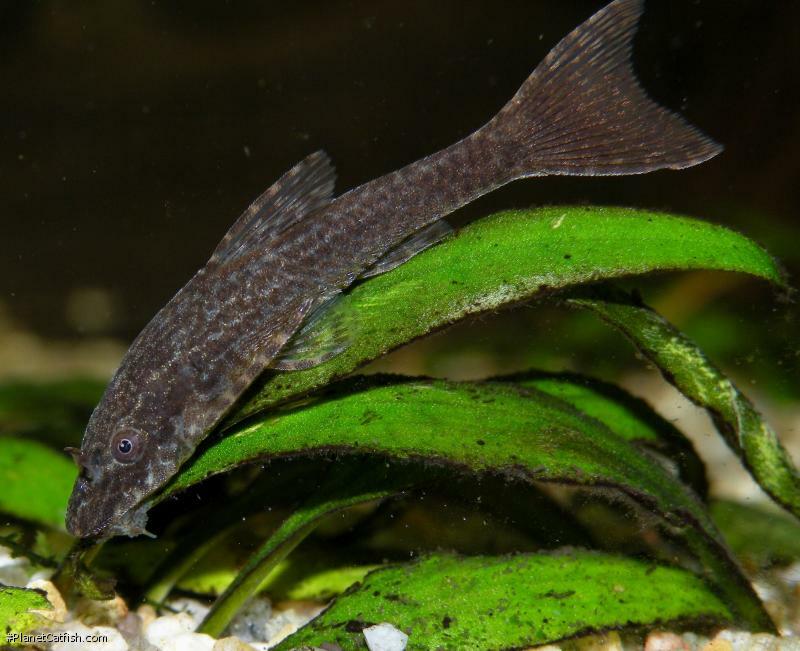 In the time since its original description, this little fish has been placed within three different genera: Otocinclus, Microlepidogaster and, finally in 2003, the fish was moved to the genus Hisonotus by Scott Schaefer(4) (the genus Hisonotus was erected by Eigenmann & Eigenmann in 1889.(5)). This miniature loricariid makes an excellent addition to planted aquariums or community tanks inhabited by smaller, calmer species of fishes. These fish can only be described as fairly undemanding with regards to care. So long as extremes of temperature and water hardness are avoided and oxygen levels are kept up a bit, the fish adapts well to life in the aquarium. The natural range for this species is from South Eastern Brazil near Sao Paulo through Paraguay(1,2, Fishbase.org). Collected from this region, it can be expected that these fish may be cold tolerant as the waters in the area are frequently recorded down to around 50°F (in winter even colder). Please note this is an untested hypothesis based on the collection locale rather than on reference materials or actual aquarium observations. However, this may account for the amazingly high levels of reproductive activity demonstrated by these fish in the aquarium. The warmer temperatures may well trigger their reproductive cycle as they breed readily and frequently in a well-kept aquarium. Females can become so gravid that they look like they are about to burst! In healthy adult fish spawning bouts may occur weekly if not even more often. This cooler temperature range may also account for why the fish seem to be fairly short lived. Most specimens I have kept have only lasted about 24 months, although most of these were imported as adult fish. There is clearly more to be learned about these interesting little fish. As mentioned above, these fish breed quite readily in the aquarium. Another interesting feature in addition to their high proclivity for breeding is that they show none of the behaviors considered typical of loricariid reproduction. In fact these fish are egg scatterers, breeding in a fashion much like a member of the callicthyid genus Corydoras. The similarities in reproductive behavior between these fish and the Genus Corydoras are extensive. The first time I witnessed these fish spawn; silhouetted in the half-light of a nightlight in my fish room, I actually thought the Corydoras in the aquarium that were in the process of spawning, not the Hisonotus. Spawning consists of a small pack of males pursuing and flitting about the females in a mob-like fashion. Eventually, only a pair will remain. Other males will appear to hover nearby for the first opportunity to join the spawning female or will go off to pursue other females on their own. The chosen male and the female will dance to various locations around the aquarium, the male all the while quickly flashing his fins to continue to stimulate the female. During the actual egg deposition, the male is immediately in front of the female rapidly fanning his fins in a posture (again) not unlike the Corydoras "T"-position. Given the small size of these fish, it is unclear whether fertilization takes place at this time, but based on observations, I would guess it is likely. During the spawning sequence, eggs are literally scattered far and wide (albeit one at a time) all around the aquarium. Favorite spawning sites appear to be at the base of leaves of broad-leaved stem plants such as Rotala spp. or Hygrophila spp. but will also include all manner of objects throughout the tank, both hidden and in plain sight. Due to this wide range dispersal, it is unclear exactly how many eggs are deposited in each spawn. Unfortunately for me, the most common indications that these fish had spawned were various Tetras feeding greedily among the plants in the aquarium! These fish do not appear to offer any parental care for their eggs or fry. This is yet another behavior that is somewhat rare in the loricariids, most demonstrate at least a minimal amount of parental care, typically displayed by the male fish (paternal parental care). Even in the superficially similar species Otocinclus affinis the male fish, while not defending the eggs in any significant manner, will remain in the general vicinity of the spawn until hatching. This apparently is not so with Hisonotus leucofrenatus. The greatest challenge in rearing these fish is gathering a sufficient number of eggs from every hidden corner of the spawning tanks to raise a meaningful number of fry. Once after witnessing a spawn, I did manage to raise a very small handful of fry to approximately 12mm long, prior to releasing them into a heavily planted aquarium where they were, unfortunately, rarely seen and eventually lost. Most all other spawns I discovered occurred in community aquariums where the other inhabitants of the aquarium (mostly Tetras) proved more effective at catching the newly hatched fry than I did. I'd often find one or two newly hatched fry in the aquarium without actually witnessing the eggs or spawn. At 78°F (23°C) the eggs appeared to hatch in roughly 5-7 days. The resulting fry are tiny but forage readily. A small bit of APR or OSI Brand Micro Invertebrate Food suspended in the water column will encourage / stimulate foraging. In the few fry I managed to raise I primarily fed APR, crushed flake foods and algae discs in addition to the typical browse materials the fry were able to forage on the leaves of several Anubas nana in the aquarium. The eggs were actually transferred to the raising tank on the leaves of the Anubas plants. Other than their very small size and broadcast scattering of eggs, these fish do not appear to be terribly difficult to raise. I believe it is time for a more concentrated effort in raising some of these tiny little fish to more accurate document (and record) their reproductive behaviors. While I have kept this fish with some successes and witnessed it spawn on occasion, their spawning in the aquarium was a less than "planned" event for me as an aquarist (planning on my part was virtually non-existent, the fishes knew exactly what they were doing!). The fish were housed in community tank settings; not the most conducive for raising larger numbers of fry. This is certainly one fish that warrants more attention despite its small size. This is particularly true in light of reproductive behavior that is largely unseen among the loricariids and is more characteristic of the callichthyids. Documenting the reproductive behavior of these fishes beyond these initial observations should be seen as a worthwhile challenge for any aquarist looking for something new and interesting. Particularly for an aquarist on a tight budget! 1. Baensch, H.A. and R. Riehl, 1997. Aquarien Atlas, Band 5.. Mergus Verlag, Melle, Germany. 1148 p.
2. Burgess, W.E., 1989. An atlas of freshwater and marine catfishes: a preliminary survey of the Siluriformes. ; T.F.H. Publications, Neptune City, New Jersey. 3. Miranda Ribeiro, A. de 1908. Peixes da Ribeira. Resultados de excursão do Sr. Ricardo Krone, membro correspondente do Museu Nacional do Rio de Janeiro. Kosmos, Rio de Janeiro [Rev. Art. Sci. Litt.] 5 unnum. pp. 5. Starr Jordan, David, 1963, The Genera of Fishes and A Classification of Fishes. ; Stanford University Press; Stanford, California; pp.652-653. Bibliography references located via FishBase.org. Type Locality Rio das Pedras [Ribeira de Iguape River Basin, Brazil]. Identification A non-descript species with an attractive if low key horizontally striped and mottled patterning. Sexing Females are larger, broader across the pectoral to dorsal area and slightly duller in colouration. General Remarks Lives sympatrically with Parotocinclus maculicauda. Other Parameters Prefers slightly cooler water. Feeding These fish appear to be predominantly herbivorous and will readily feed from a wide array of aquarium fare. Algae discs can make up a good portion of their diet, supplemented with any number of additional prepared flake or pellet foods. Furniture Really does best in a planted aquarium, other cover is not necessary although the fish has at least a passing affinity with rounded peebles. Suggested Tankmates Most small community fishes that prefer a little current and temperatures on the lower side. Breeding These fish are egg scatterers, breeding in a fashion much like a member of the callicthyid genus Corydoras. See CotM article link below for more details.